I’m taking these deviled eggs to the next level. French onion deviled eggs are a thing! Every spring, I love making some wild and wacky (but delicious and not weird) version of deviled eggs. 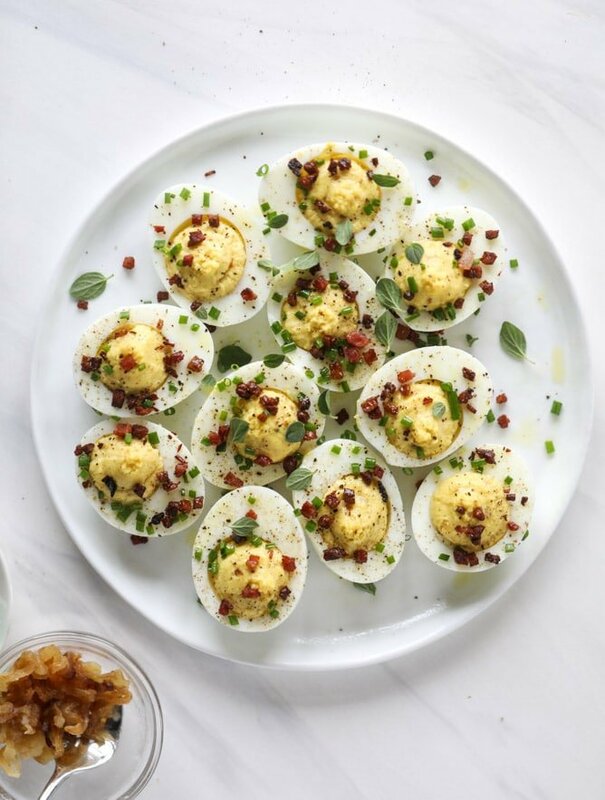 My favorites would probably still be the bacon blue deviled eggs with asparagus, but last year these sesame sriracha ones gained some love too. The are both egggcellent. 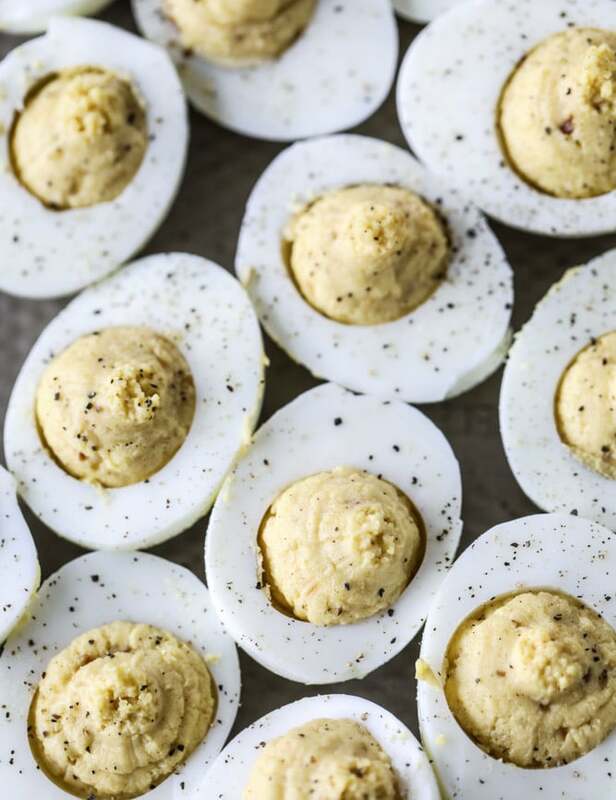 But really, we freak over deviled eggs here. And even my mom, who lives and dies for the traditional version of everything (i.e. she does not always appreciate my trashing up of our longtime recipes), was losing it over these French onion deviled eggs. She was still talking about them a week later. I was shocked! I’ve loved French onion dip forever and ever. Like truly, since I was a very small child. Mother Lovett used to have it as a staple in her fridge. Along with piles of fritos and other random bags of chips in a cupboard in the kitchen. A few years ago, I made a homemade version of French onion dip that is seriously divine. Dips are just the best thing ever because even if you’re eating better and focusing on healthy foods, you can dunk vegetables into dip. Right? I mean, it can go like that. I’m sure of it. And I don’t know exactly how I decided to French onion-ize said deviled eggs. But I’m so glad that I did. Guess what? There is an ENTIRE caramelized onion whipped into this filling. You caramelize a sweet onion until it’s golden and sweet and, well… caramely! And then you whip it into the egg yolks with some of the more traditional deviled egg ingredients, like a touch of mayo, Dijon – and I like to add greek yogurt too. It ups the wow factor. On top, we have some crumbled pancetta (I’m having a moment with it right now and have another pancetta-filled recipe coming this week!) and a sprinkling of chives. There is so much ridiculous flavor in this little egg that I don’t know what to do with myself! These are kind of like secret deviled eggs too because they don’t look like much. They just look… REGULAR. And then you take a bite and it’s like whaaaaat is going on?! Flavor is over the top. 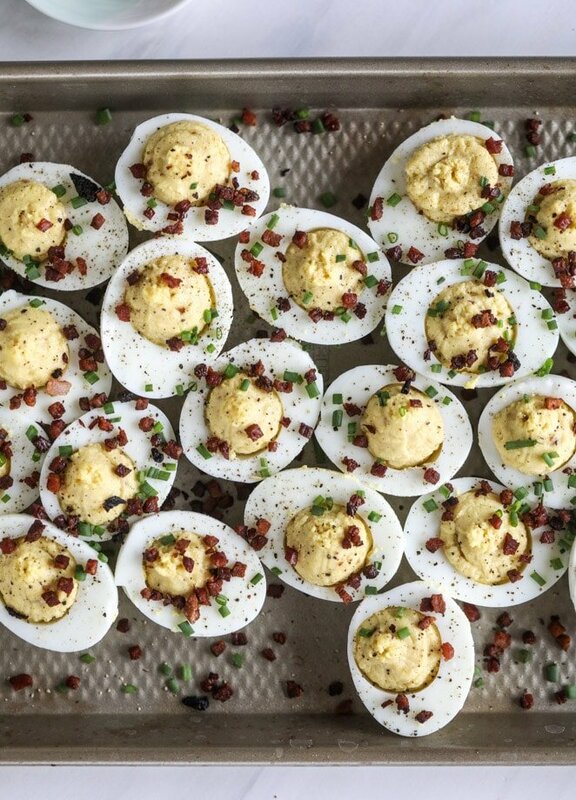 So what kind of deviled eggs are you making this year? Right after Easter, I’m also going to share my favorite egg salad recipe (it was my pregnancy obsession through both kids and you guys always ask for it!) in case you have lots of leftovers! Eggs are just the BEST. Heat a large skillet over medium-low heat and add the butter. Add the sliced onion and the salt and toss to coat. Cook, stirring occasionally, until the onion caramelizes - this can take 45 to 60 minutes! You want to do it low and slow so the onion fully caramelizes. If at anytime the onion starts to burn, turn down the heat! Once the onion is caramelized, turned off the heat. While the onion is caramelizing, make the eggs. To boil the perfect egg, place the eggs in a large pot and fill it with cold water. Bring it to a boil and let bubble for 1 minute, then turn off the heat and cover the pot. Let the pot sit for 15 minutes. After 15 minutes, place the pot in the sink and fill it with cold water to cool the eggs down immediately. You want the eggs to sit in cold water for 30 minutes or so, so you will need to dump the water and refill with cold water a few times. You can add some ice cubes too! In the meantime, while the eggs are boiling, heat a large skillet over medium-low heat and add the pancetta. Cook until crispy and all the fat is rendered, then remove the pancetta with a slotted spoon. Place it on a paper towel to drain excess grease. 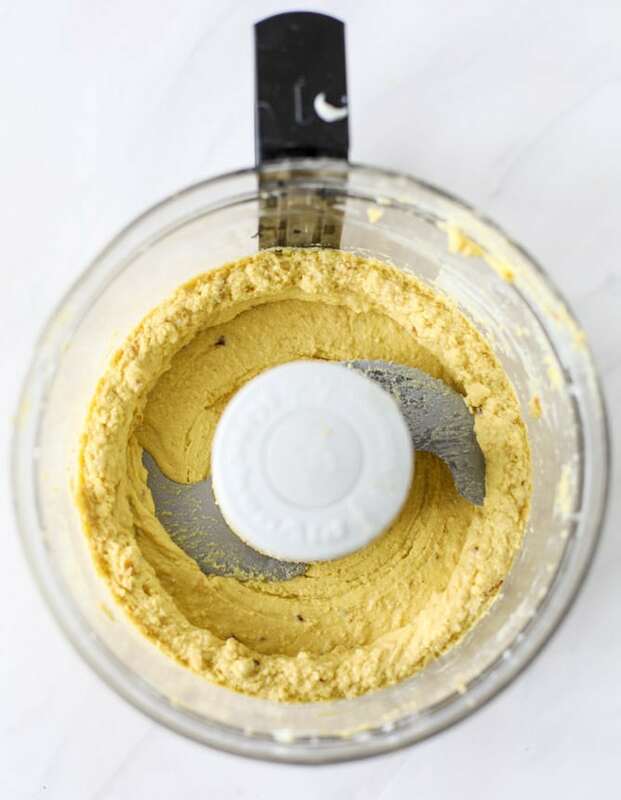 Add the egg yolks, mayo, yogurt, mustard, caramelized onion, pepper and garlic powder to the food processor. Blend until smooth and creamy and mousse-like. You can taste and add additionally salt if needed. Scoop out the mixture and spoon it (or pipe it with a pastry bag) into the open egg whites. Sprinkle on the pancetta and the fresh chives. Add the fresh oregano and serve! Oh my god. We just had your French onion grilled cheese this weekend so now I have to make these! It looks very appetizing. Thanks for the recipe! So fun! I just made a similar twist with French Onion mix and crispy french onions on top! 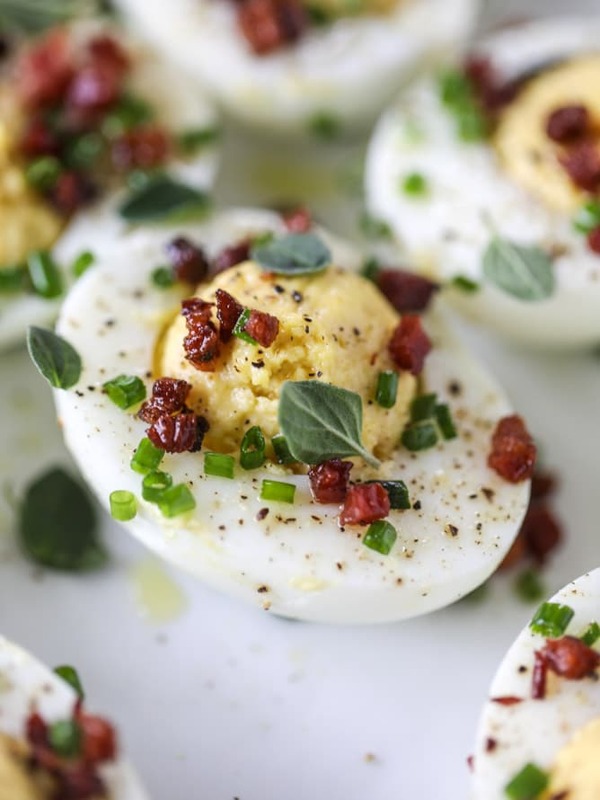 Another variation I love is Taco Spiced Deviled Eggs! Taco seasoning and topped with roasted corn/tomato/avocado/etc! I also love Greek Deviled Eggs with caesar dressing, feta, cuke, tomato. This is off-topic, but uh, have you seen this glitter mask and will you please try it and let us know how it goes??? These sound amazing! 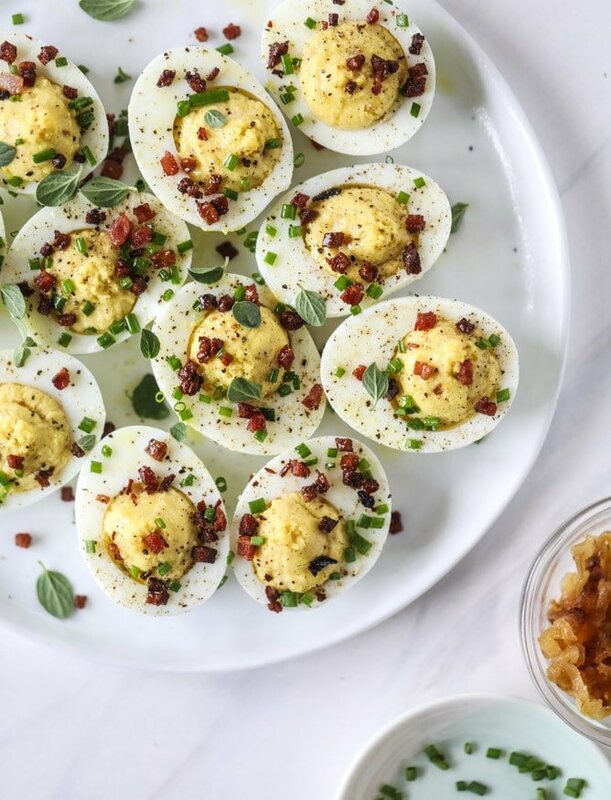 My family always makes classic deviled eggs for Easter…maybe I’ll have to switch it up this year. You’ve got my heart beating eggscitedly!! (I know, I couldn’t resist) I love the idea of caramelized onion — I’ve been on the craze too. I just put the onion in my goat cheese dip. 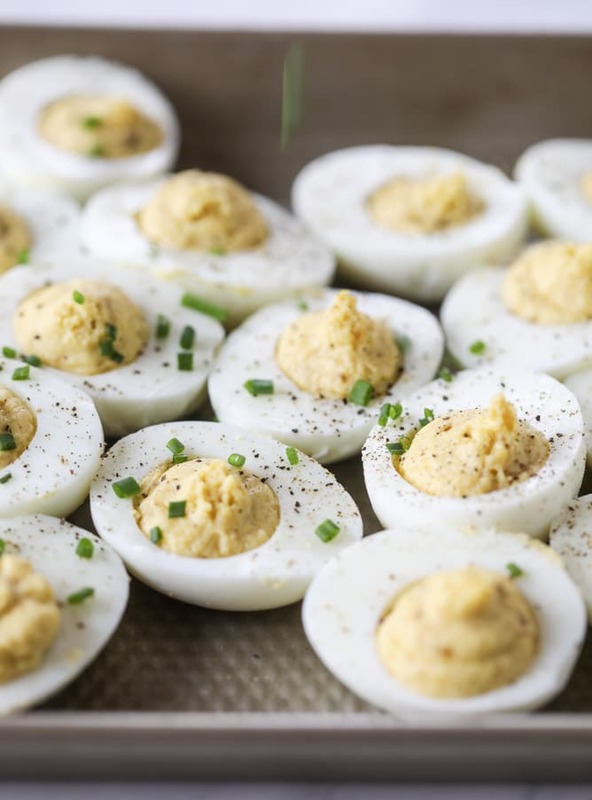 I used to make deviled eggs for my kids as an after-school snack. They still love those eggs. I’ll have to try these out on them. It sounds delicious. I’m loving my Pretty Dish cookbook. I’ll be making the recipes once I get back home. These look delicious! I am going to be trying a new deviled egg recipe and hope to put it on my (very) new blog. I love your blog! Thanks for inspiration! I’m a Pennsylvania girl too! Have a great day! 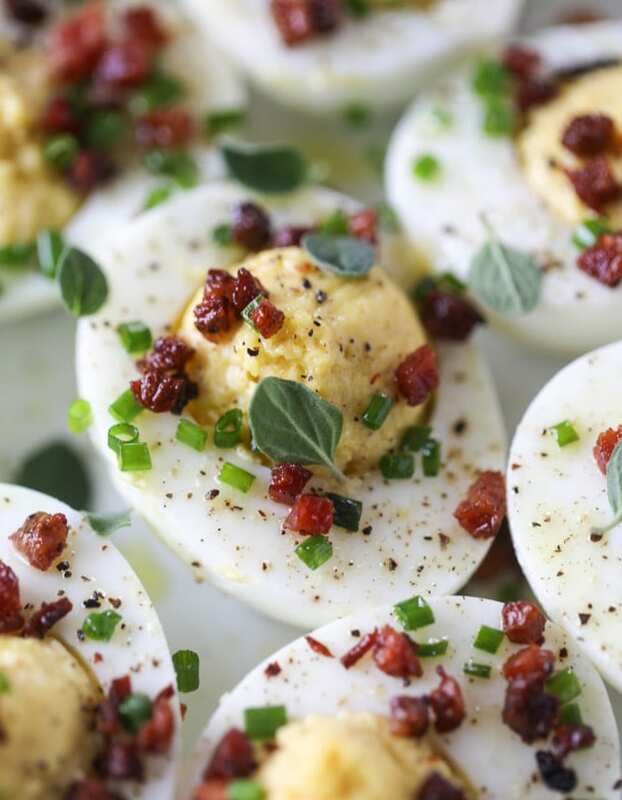 I think throwing in a little goat cheese into that deviled egg might make it insanely delicious. Just a thought…. Also Gruyere is another very interesting possibility (in the French Onion theme). But then again, you probably couldn’t go wrong with just about ANY kind of cheese in that deviled egg combination. Two of my favorite things — deviled eggs and French onion soup — in one convenient package?? YES, PLEASE! lol your’s look SO MUCH prettier than mine. But they taste delicious! The caramelized onion is subtle but so tasty. I added crispy fried onions on top tonight which was great (good crunch) and will be doing crispy prosciutto tomorrow. yum! 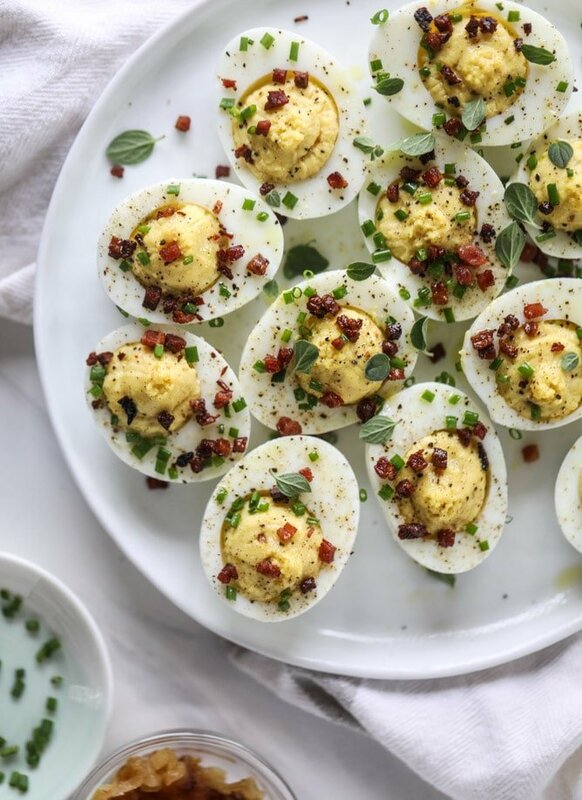 I’m not really a deviled egg fan, but these won me over! Made these for Easter Sunday dinner appetizers. They were so amazing! Totally a keeper!